On July 9, a federal judge in Los Angeles, Judge Gee, who oversees the Flores Settlement Agreement, denied the Trump administration’s efforts to overturn the Flores requirements that govern the length of time children can be detained and the conditions of their detention. Following Trump’s June 20 Executive Order on family separation, the Trump administration asked that the judge modify the Flores agreement to allow the government to detain children indefinitely and place them in shelters without state licensing. Judge Gee rejected that request in a strongly worded order. The cities of LA, SF, NY and Chicago filed an amicus brief in support of maintaining the requirements of the Flores agreement. In their brief the cities defended the importance of the state licensing requirements as a “critical check on the adequacy and competency of organizations” operating the children detention facilities. The cities noted that the only possible reason for the government’s desire to end state licensing is to dodge “oversight and accountability” regarding the treatment of children. As a result of this order, DHS continues to be required to process and release children within 20 days. The Trump administration has not yet indicated if it will appeal Judge Gee’s order. The judge in the San Diego family separation case, Li v. U.S., ordered the government to reunite children under the age of 5 with their parents by July 10. The government reports state there are about 102 children under the age of 5 who were separated from their parents under the Trump family separation policy. On July 6, the government informed the court that it will only be able to reunite half of those children by the July 10 deadline. ICE admitted that children under 5 are detained in 23 facilities across 13 states. The judge refused to grant a blanket extension of the deadline. On July 10, the government submitted a report indicating that it was still in the process of reunifying children – but did not provide independent verification of the number of children reunified nor whether there are additional children who should be on the government list. Under the judge’s previous order, the government must also reunite children over the age of 5 by July 26. On June 26 the State of Washington and 17 State Attorneys General filed a lawsuit, State of Washington, et al. v. USA, challenging Trump’s family separation and detention policies. Although the judge in the San Diego case, Li v. U.S., ordered the Trump administration to reunite immigrant children forcibly removed from their parents, the judge’s ruling did not address other important issues related to family separation and detention. On July 2, the Attorneys General asked the court to allow expedited discovery in order to obtain and preserve evidence regarding the family separation policies. The AG’s pointed to the government’s control over primary witnesses, its constant change of positions, and the “deep and enduring harm” of the separation and detention practices. The government has not responded to the request to expedite discovery. On Wednesday, June 20th, President Trump signed an Executive Order pertaining to family separation. The order mandates that immigrant families be held in family detention. Instead of terminating the administration’s cruel “zero tolerance” policies targeting vulnerable families, this order undermines real solutions to family separation while continuing to violate the rights of refugees seeking legal asylum. In addition, family separation will persist, as any assigned jail time must be served in Department of Justice (DOJ) custody away from their children. Trump's executive order does end family separations, but replace them with the indefinite detention of children with their parents in detention centers. "Indefinite" means indefinite in the immigration enforcement system: there was a case of an asylum-seeker from Ghana who spent 10 years in detention. Family detention is not a solution to family separation. Take action today to decry family detention, and changes to asylum law.  The Department of Justice comment recording line: 202-353-1555. Call the Department of Justice’s main comment line at 202-353-1555. Tell them that the decision of Attorney General Jeff Sessions to deny asylum to victims of gang violence and sufferers of domestic violence is wrong. These people need protection. My name is [NAME] and I live in [CITY/STATE]. I am calling to tell Attorney General Jeff Sessions that I do not support his asylum decision in the Matter of A-B. With this order, he and the Trump administration has turned its back on some of the most vulnerable people in the world. I demand the Attorney General stop his anti immigrant agenda. I, and many other citizens, stand against hate and xenophobia — and demand that the Department of Justice do the same. Thank you for standing with us against the Trump administration's heartless agenda. Republican senators could be very helpful. This is the most radical bill of the bunch and arguably only tangentially related to the issue at hand, but it’s important because it gets at the detention system itself, and is worth championing. Here is a list of organizations that are on the front lines of this crisis. They desperately need financial support NOW. RAICES *Note they also have a bond fund you can donate to, to help people get out of detention and reunite with their families. We’ll have one in Washington state very shortly through the WA Immigrant Solidarity Network. And of course closer to home, the Northwest Immigrant Rights Project. From the Church Council of Greater Seattle: “Provides financial support for humanitarian and transportation needs of the asylum seekers detained at SeaTac. Many of the asylum seekers are likely to need support to be reunited with their children on the Southern border. For non-monetary donations, Catholic Charities of the Rio Grande Valley has a Humanitarian Respite Center that assists migrants and refugees in the area (they also have an Amazon wish list). You can also give non-monetary donations to the Kino Border Initiative. CARA Family Detention Project is recruiting indefinitely for attorneys, law students, or paralegals with an understanding of asylum law in the United States. Northwest Immigrant Rights Project has volunteer opportunities for Spanish-speaking or Cantonese- speaking attorneys. They could use help from translators and interpreters as well. Search for these opportunities on the page. How You Can Help End Family Separation and Ensure Protection for Children. (Kids in Need of Defense - KIND). Good resource. This is the best article going around on this topic: “Defense Contractors Cashing In On Immigrant Kids’ Detention.” Betsy Woodruff, Spencer Ackerman, DailyBeast, June 14, 2018. Sleeping Giants is researching this and coming up with new companies at a good clip, so subscribe to their Facebook page or Twitter if you want to focus on this. Hey, check it out! OWC made a law! The Orcas Women's Coalition (OWC) Immigrant's Rights Group (IRG) came into being at one of our very first OWC meetings. In the beginning it was co-led by Anneke Fleming and Amanda Tarkington, and grew rapidly over the next few weeks. IRG quickly identified various needs in the immigrant community, one of which was for a legal defense fund for immigrants. In a few short months Jackie Brumfield organized a non-profit organization under a 501 (c) (3) umbrella organization for that purpose, a crucial but time-consuming effort. IRG next studied the legal protection already in place for immigrants in our county, and found it wanting. It consisted of a well-intentioned but not terribly detailed Resolution and a few policy guidelines voluntarily adhered to by the Sheriff's Department. The enforcement mechanism was basically a Gentlemen's Handshake. Not being Gentlemen, the IRG women felt there would be more security offered by having the County Council adopt a stronger Resolution based on Model Sanctuary Provisions which had recently been developed by the New York Attorney General. Attorney, and OWC IRG member, Elaine Thomas wrote the Resolution first presented to the SJC Council in March 2017. March 1, 2017 – IRG sent a resolution to the County Council for their consideration. March 3 – IRG steering committee and others met with Randy Gaylord, Ron Krebs and later Kevin Ranker. Gaylord and Krebs saw no need for a new resolution. After the election of President Trump, political action groups had formed on each of the islands. They joined OWC IRG in a letter writing campaign to the County Council in support of the resolution. April 24 – IRG members met informally in Friday Harbor with Councilman Bill Watson and on the ferry back to Orcas with Councilman Rick Hughes. Rick said he thought that there was no need for a new Resolution and that he would not put it on the Council agenda. He recommended that IRG file an initiative. April 24 – May 8 Elaine Thomas and Elly Hoague used the Best Practices developed by the WA State Attorney General and the New York Model Sanctuary Provisions and the San Juan County Charter and Code to turn the proposed Resolution into an Initiative for an ordinance. May 8 – Elly filed as sponsor for the Initiative with the county Auditor with the intent that it be on the November 2017 ballot. 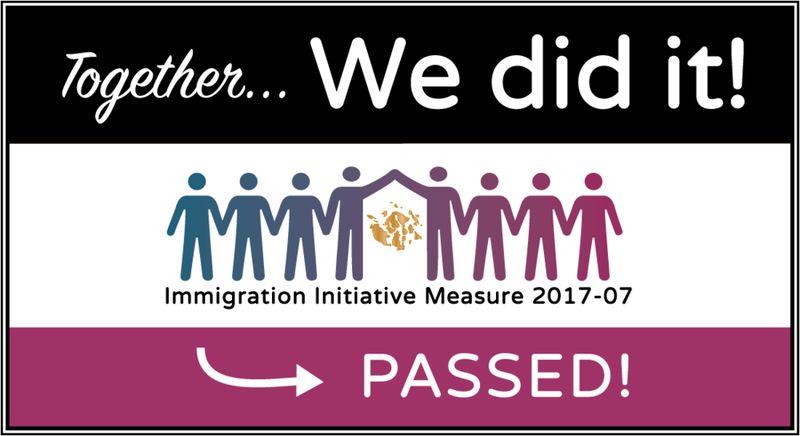 May 12 – The Initiative was accepted as to form and numbered Initiative 2017-06. May 16 – IRG, facing a big signature goal on a very short time line, met to decide whether to proceed with an initiative campaign, pull the initiative and continue lobbying for a non-binding resolution or forget the whole project. Given the Trump administration's aggressive pursuit of immigrants, and bolstered by the promise of strong support from their sisters in PACE, IRG committed to campaign for the initiative! May 22 – Randy Gaylord entitled 2017-06 in such a way that it split the initiative into two issues, which would trigger an automatic legal challenge (initiatives can address only one initiative at a time). When Elly asked why he had rejected Elly's suggested title and instead created one that caused legal difficulty, he negotiated with Elly for changes to the Initiative. May 23 – Elly filed a new Initiative with the Auditor with the changes asked for by Randy Gaylord. It was given the number 2017-07. May 30 – Randy Gaylord still had not approved and released the negotiated Initiative with a new title, hence delaying the printing of the Initiative Petitions. OWC, PACE, and IRG called on SJC Democrats, Our Revolution, Lopez Huddle, Waldron WE, and Shaw Resistance for email and phone call pressure to release the petition. The response was swift and effective! June 1 – The Initiative Petition was approved and the petitions were printed. They were handed off to the organizers on the various islands by ferry, and before the ink had dried the signature campaign had begun. Natalie Menacho put together a logo and a petition board for the front of the Orcas Food Co-op, Elly Hoague had three banners made with Natalie’s logo, and Jan Ehrlichman made beautifully designed sandwich boards to wear while collecting signatures. OWC and friends swarmed like honeybees, sitting in front of stores, working the farmer's markets and ferry lines, signing up neighbors, pals, fellow party-goers and dinner guests and, many times, total strangers. 200 people gathered signatures. Collectively, we blew away our goal. July 5 – The petitions were turned in to the Elections office for certification of validity of signatures. About 2665 signatures were submitted, of which 2365 were eventually certified as valid. This number represents close to 22% of the voters in the last General Election. We only needed 15% to qualify. July 13 – The Auditor issued a Certificate of Sufficiency for the Initiative which meant that it would be placed on the November 2017 ballot, barring adoption by the County Council. July 13-24 – Now that immigration activists throughout the islands had demonstrated overwhelming popular support for the proposed ordinance, a new campaign began: we wanted to have the County Councilmen adopt the Initiative rather than waiting for a vote in November. Advocates from all islands wrote and called their councilmen. State Senator Kevin Ranker and Lieutenant Governor Cyrus Habib weighed in on the issue ( Much gratitude!). Gretchen Krampf and Sheila Gaquin wrote press releases for the local newspapers. Judy Scott, Anne Marie Shanks, Janet Alderton and Elly Hoague met with each member of the County Council separately to educate them about the Initiative. Jamie Stephens signaled his support and agreed to make a motion for a Public Hearing, the next mandatory step in the process. All the island activists worked to talk to their councilmen. Unfortunately, Bill Watson and Rick Hughes remained unconvinced. Notwithstanding, we all plugged away at every opportunity we had, writing, calling, meeting informally and formally, putting in our 3 minute comments at County Council meeting during “Citizen Access” time. July 25 – Yet another cliffhanger episode began with a heated discussion on the ferry trip to the Council meeting. Rick Hughes and OWC member Cindy Wolf debated whether it was too late to adopt the initiative based on the governing ordinance of the procedure and whether and why the Council might adopt a competing Referendum. Later that day, leaders and members of OWC, Our Revolution, SJC Democrats and other advocates gave rousing citizen input at a County Council meeting that began 2 hrs late due to an unexpected need for the councilmen's presence at a canoe voyage ceremony. After Citizen Input time, Rick Hughes grilled Randy Gaylord and F. Milene Henley, County Auditor regarding procedures, time lines and legality. It Randy Gaylordwas determined not only that the ordinance was pretty darn legal, and but that it was too late for the Council to create a competing Referendum Ordinance to gofor be on the November ballot. However, and but that with the assistance of the Auditor, the County Clerk and the Prosecuting Attorney it was determined that the Council could adopt the Initiative 2017-07 as an ordinance if they acted before August 18. Jamie Stephens then moved to set a Public Hearing for August 15 which was the first possible date after the mandatory ten-days-prior public notice could be published in the newspaper of record. After expressing some serious discomfort and giving Elly a good public talking-to, Rick Hughes seconded the motion. Bill Watson was absent and the adoption process would have stopped right there had Rick refused to second. Rick did insist on not waving the “three touches” rule and set aside time for further discussion at County Council meetings set foronon July 31 and August 8. This meeting was recorded as the first touch of the CC. July 31 – During Citizen input Access time, our own Caitlin Herlihy Leck gave a beautiful speech about bearing the torch of hospitality and compassion and being on the right side of history. Susan Martin, retired Professor of Immigration Policy Studies at Georgetown who shaped the Clinton Administration's Immigration policies, used her time to educate Bill and Rick about the consequences of good and bad local laws. Other wonderful advocates also spoke eloquently, but those two women were show-stoppers! Jamie was absent. Bill Watson asked whether it would mean more to the immigrant community for their neighbors to vote on the initiative than for “three old white men” to adopt it. The IRG-PACE strategy team decided this was best addressed by asking community members (specifically those with legal immigration status, for obvious reasons of safety) and people who work directly with immigrant families to speak to the question. This meeting was the second touch of the CC. August 8 – IRG asked During Citizen Access time a group of representatives from the Hispanic community (three two young immigrants with tentative immigration DACA statuses, the Superintendent of Schools for San Juan Island, and a a US naturalized citizens from Waldron, and one US citizens from Lopez and San Juan Island) spoke eloquently to share of their experiences and observations of the Latino immigrant community's interactions with between the Hispanic community and the sheriff/ and local government. All brought great information and spoke with genuine feeling with their words. Another dynamic activistwoman, Celina Wright (whose uncle was the first member of the United Farm Workers) also came to speak on behalf of Hispanics she knows who lives on SJI. Her uncle was the first member of the United Farm Workers. (Celina is also a dynamic activist in her own right). Ann Beck-Witte gave eloquent insight into the additional stress the elements of fear and distrust put into policing situations faced by her nephew, “the cop I love.” All County Councilmen were present and visibly moved by this particular day of citizen input. This meeting was the third touch of the CC. August 15 – The big day dawned and a crowd of over 50 compassionate activists gathered on the courthouse lawn and then moved to the Hearing chamber and overflowinged the Hearing chamber into adjacent rooms. Prosecuting Attorney Randy Gaylord made an a hour and a half long presentation setting forth long enough to thoroughly kill the Sunflowers Cindy brought in her pickup truck to decorate the county fair booth. He tried to kill the adoption process as well, interpretingsetting forth what he believed to be the possible problems that adoption of the ordinance might result in. in as dire a manner as possible all the parts of the ordinance that might conceivably cause a problem for anybody in the county government and bewailing what he felt was the ill-advised stance of non-cooperation with federal immigration enforcement agencies. Brief but powerful public commentary followed at the Public Hearing. The video is available on the county website: http://www.sanjuanco.com/903/Council-Agendas-and-Video . The Public HearingIt ended in cheers, clapping and tears all around as the County Council voted unanimously to adopt the ordinance; amidst cheers, clapping and tears. August 25, 2017 the new ordinance went into effect. THE PEOPLE OF THE COUNTY WON. Check out this NY Times article from 8/21/2017.